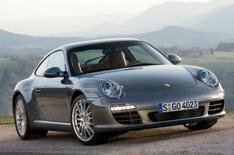 Driven: Porsche 911 C4S PDK | What Car? Porsche is never content. The look of the 911 might be old, but its still being updated, tuned and refined. The latest version to be tweaked is the Carrera 4, available in Coupe and Cabriolet models. Its powered by a new direct-injection 3.8-litre engine, producing 354bhp in the Carrera 4, and 385bhp in this, the Carrera 4S. Theres also a new electronically controlled four-wheel-drive system to maximise traction and stability, along with a new active suspension set-up. You can even add the recently launched seven-speed PDK semi-automatic gearbox, for a sizeable £2338. Leave the suspension in standard mode and youll get to where you were going without any drama whatsoever, and a lot earlier than you were expecting. The C4S is extremely fast, yet easy to live with and obedient on motorways, country lanes or even congested urban streets. The PDK changes gear so smoothly you almost dont notice, while the suspension is firm, but doesnt jar your fillings. Its not until you push hard that the four-wheel drive comes into full effect. The way the power is transferred between the rear and front wheels, to maintain maximum grip and handling, is seamless, giving fantastic control and stability through corners. Select Sports mode and things become more frenetic. Engine response is sharpened, the suspension firms up and the gearbox changes gear faster. If youve specified the Chrono Sports Plus option (520 with a manual gearbox and 713 with the PDK) and are feeling brave, you can also select Sports Plus mode. This unleashes the cars true potential, sharpening the suspension and throttle, and setting the gearbox to race-car mode. You also get a new touchscreen communication system, which controls the audio, navigation and built-in phone, and somewhat sweetens the C4Ss on-the-road price of £73,146. Build quality is typically faultless, with well laid-out controls and easy-to-read instruments. Porsche has also subtly restyled the front and rear by adding LED running lights. However, despite being slightly faster, the Porsche lacks the drama of Audis R8, and isnt quite as exciting. It is more fuel-efficient, though, and emits noticeably less CO2, but at this price your wallet may not notice the difference. Likely discount Porsche dealers dont know what a discount is, so dont hold your breath.